This recipe has just rocketed to the top of my 'Recipes I'll Make Again' list. Feeling slightly under the weather again, I was looking for a Friday lunchtime treat that was quick, simple and tasty. And this soup hits the spot. It's the kind of thing that in an ideal world, I'd have made for me on days when I'm too poorly to move from under the duvet. Two problems there. 1) I never get the opportunity to have such a day, no matter how poorly I am and 2) There is nobody else in the house with the culinary nous to deliver such a delightful treat. But it's definitely easy enough to make if you're feeling just a little poorly and need something restorative to blow those cobwebs away. Even the smells whilst it's cooking are amazing. I'm not a fan of aniseed or cinnamon, but they lend a lovely flavour to this soup. It's also packed full of veggies to make it nice and healthy and keep it colourful. The original recipe calls for mint and basil to be stirred through at the end but I only had coriander to hand. 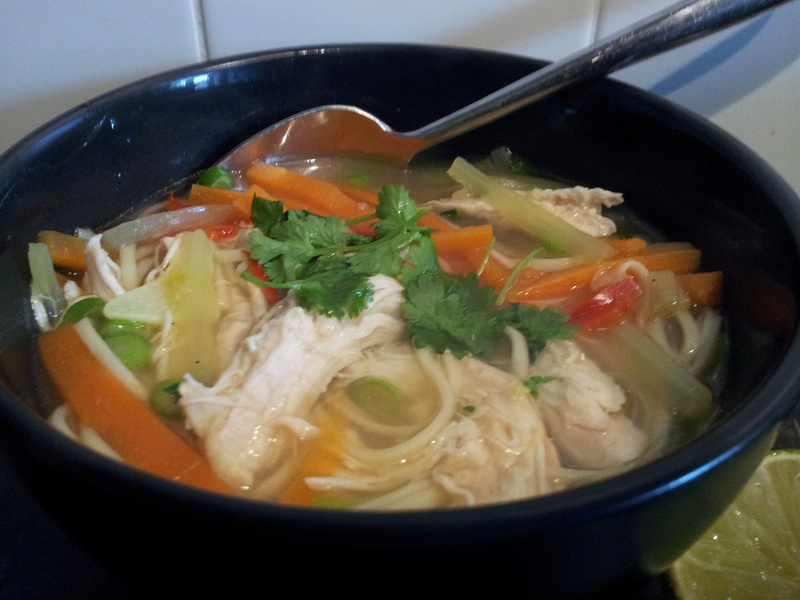 That worked really well with the lovely Asian-style spicing, further enhanced by the squeeze of lime juice at the end. The recipe is from Lorraine Pascale's Home Cooking Made Easy. I can't find the recipe online so will be good and not post it here (because I'm a huge fan of this book and Ms Pascale and have posted some of the other recipes). But you can buy the book on Amazon for £9.99 (at the time of writing) and I really think you should! Alternatively, try this recipe from BBC Good Food which I blogged about here.